Bronze doesn’t jump to mind when thinking about materials suitable for weaving. But Yoshitomo Saito brings a certain delicacy to his bronze “weavings,” or castings. His process involves pouring molten bronze into molds, then welding together the resulting reed-like pieces. 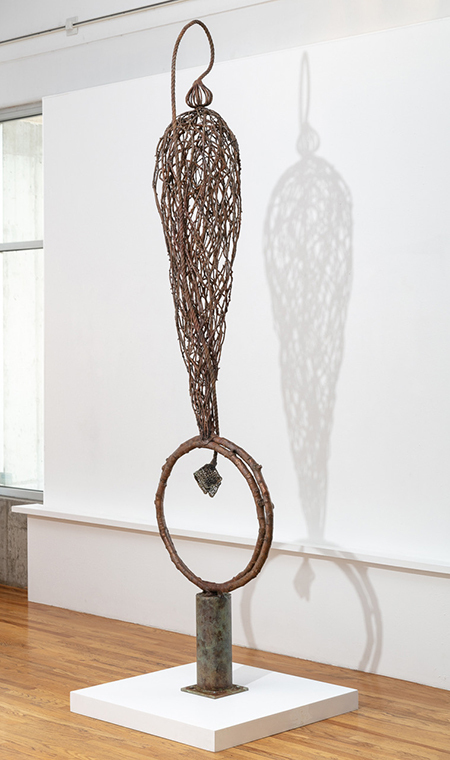 In his solo show “Woven,” bronze undergoes an intriguing transformation, becoming surprisingly meditative and serene. Part of this aesthetic is due to the way Saito’s works suggest simple, utilitarian objects, with shapes that resemble brooms, baskets, fishing nets and urns. “Kakashi (Scarecrow)” calls to mind a figure made of twigs but in this case poised on two nested wooden hoops. The organic nature of this and other pieces speaks to the contrast between Saito’s hollowed-out bronze forms, with their interlaced effect, and the heaviness typically associated with bronze objects. The standout piece, though, diverges from weaving as a a template yet is still inspired by mundane objects. The installation “1000 Prayers” consists of 670 unique cast-bronze pine cones, strewn across a wall. The work takes on different dimensions and shapes wherever it’s installed. Here, it forms a wall-length, almost birdlike shape; in all, it’s 500 pounds of mini bronze sculptures carefully spaced apart and imperceptibly anchored to the white wall. The effect is immersive, and complementing the viewing pleasure are the handful of intentionally understated pieces placed in front and near it, such as a 3-foot-wide tilted vessel called “Forest Babushka.” Saito’s work is austere and complex at the same time. Also interesting is the way his pieces are often placed on the floor instead of on pedestals, or are positioned on caster wheels, as if summoning the humble origins of the objects they resemble. Saito, a Colorado-based artist, has stated that he straddles two cultures — Japanese and American. As such, his work is informed by the idea of dual affinities. Perhaps that’s why “Woven” resonates so well — we are all products of interwoven cultures.